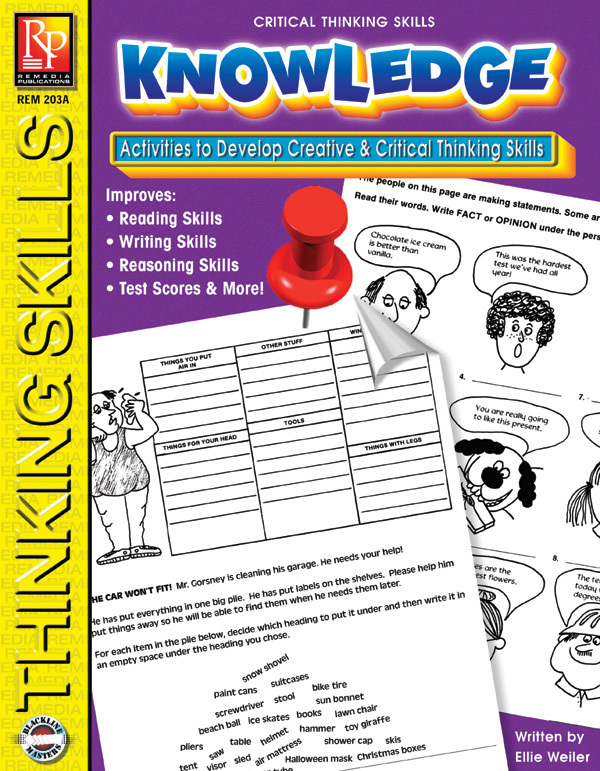 “Knowledge” is defined by Bloom’s Taxonomy as “the obtaining and recall of information.” As such, it is an important step in building effective thinking and problem solving skills. When students are able to absorb information or easily recall it, their ability to effectively think and reason is expanded. The 26 lessons in this unit provide plenty of practice in areas that emphasize knowledge. Classifying shapes and words: (“Things you put air in: beach ball, saw, tires, skis…”), analyzing images: (“If the sentence is a FACT you can prove by the picture, write FACT on the line.”), distinguishing real from make-believe (“Mr. Bibble sent his nephew a monkey that could make a banana cream pie.”) are just some of the exercises featured.